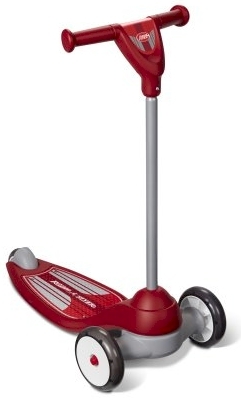 Walmart has got this Radio Flyer My First Scooter Sport down to $19.97 with free in-store pickup (free shipping starts with a $35 minimum order). These normally go for around $30, so this is a nice 30% price drop (compare to Amazon). Nice Afikoman gift for your 2 to 5 year old (promotes coordination and balance skills)! Description: The My 1st Scooter Sport is perfect for beginner riders, and is designed to help develop balance and coordination. It also features a wide base that is low to the ground and two wheels in front for maximum stability and safety. The turning radius is specially designed to provide additional safety without compromising mobility. The comfort hand grips and textured deck help younger riders stay on the scooter.